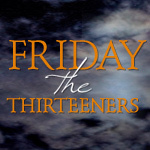 Cross posted from the Lucky 13 blog - A little chat between 2 author friends. 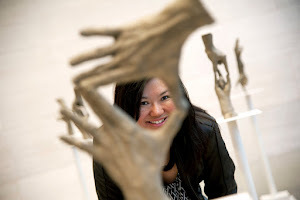 Elsie Chapman, author of the fabulous YA novel, DUALED, talks to me about Prophecy and K-dramas! Elsie: When Ellen and I got together to discuss what we could do for this Luckies post, we both agreed on a couple of things. 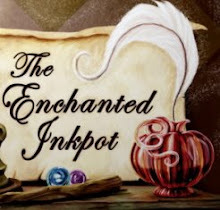 One, we wanted to do something a little different than a typical author interview. 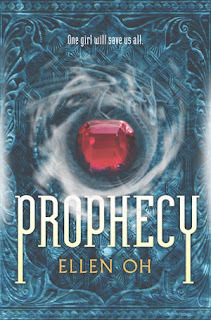 Today is, after all, a HUGE day for Ellen--release day for her Korean-inspired YA fantasy PROPHECY! Even as I'm typing up these words, I still can't quite believe it's here. All of the Luckies couldn't be happier and more excited for you, Ellen! Look for this awesome cover in bookstores, you guys! Ellen: Wow, it was a long road to publication, but I finally made it! I feel like I should have an applause app on my iphone so that everytime I say my book is out I can press it and cue wild applause! Elsie: Hah! And two, while we wanted to celebrate PROPHECY, we also wanted to incorporate gifs as well as eye candy...somehow. Ellen: I blame Elsie for my addiction to Gifs. Elsie: I'm proud of my gifs, so yay! 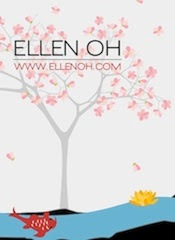 Well, I admit to not being up in my kdrama knowledge, Ellen. *hangs head in shame* Which is why this post is perfect! And in some weird, six-degrees-of-separation-way, this is pretty much the meta-PROPHECY post. You've got your love of Korea in here, as well as your eye-candy and gif fixes! Ellen: So we know if Hollywood were making this into a movie, it would be completely white-washed, so this is my chance to produce my imaginary film starring some popular K-drama and K-pop stars. But I had a really hard time trying to figure out what female actor could play Kira, my main character. I think this is because I have such a very specific look in mind and she can’t be super skinny. Most K-drama actresses are extremely thin, with absolutely no muscle tone whatsoever. That wouldn’t work for Kira. She’s all lean muscle and solid. And tough. She’d be the type of person whose unsmiling face would be intimidating. So having this really specific idea, I couldn’t come up with anyone on my own. But Jaewon, on the other hand, was a lot easier. If PROPHECY was a movie right now, I have a few ideas of who I would want to play the role of Jaewon. He is the singer/rapper for the popular K-pop band 2PM and also has starred in several K-dramas. His most famous role is probably as Jin Gook in Dream High, a show about a bunch of singers trying to make it in a music high school. He plays the strong, stoic type with a sweet side to him. Elsie: Ellen, you made this gif yourself? Nice that you slowed down the speed so we can truly appreciate his face. Plus Jaewon really is both strong and stoic, so I love how you picked out those two traits. Ellen: Yes, I think I got this Gif making thing down now, having learned from the best (Ms. Elsie Gifman, ha ha). Ok so this next guy is actually really young – like 17. So actually the perfect age for Jaewon. Plus he is my oldest daughter’s pick as he is the lead singer of her new favorite K-pop band C-Clown. Kangjun is the lead singer of a new K-pop band and I can only go by his looks, but he has the pretty boy look. Elsie: Pretty "boy" is right. Hah! Wait, I'm not implying you're old or anything. And, well, Jaewon is that age, so it only makes sense. Though I can't even begin to imagine him in a kpop band, can you? Ellen: I’m definitely old because when I look at this kid, I feel like a dirty old man. And no, Jaewon can’t sing at all. It’s such a shame. When he sings, he attracts herds of moose looking to mate. Look, he’s got the strong, handsome, with a tragic past thing going on here – absolutely no singing allowed. So to that end, we have our last contender, who also doesn’t sing. To see why I think he would be great, you have to see him in his role as Geol-oh in Sungyukwan Scandal. He’s tough on the outside but a real softie on the inside. But mixed up in all of that is real pain from the loss of his brother. So from an acting perspective, I think Yoo Ah-In would be perfect for the role. Elsie: Ellen, I love how you selected Yoo ah in based on his ability to show the different aspects of Jaewon's background, which is huge in shaping character. Ellen: Jaewon is a great character. He’s a genuinely nice guy with a tragic past that haunts him to the point where he believes he doesn’t deserve any happiness in life. He’s been estranged from his own clan for a long time and also does not tend to associate with other people, other than to gamble, which is his chief way of making a living. Except for his best friend/servant, Seung, he is a loner. So when he meets Kira, his lonely soul can see hers and that is their connection. Elsie: So the question is, who would YOU pick as Jaewon? Leave some comments for us, guys! And Ellen, just saying again how proud I am of you. This is a huge, momentous day, and I'm so happy that PROPHECY is out in the world. Congrats, girl! There's also Han Groo in "Girl K/Killer K". I haven't seen it yet but heard really good things about it. She's still slim, but not break-if-you-touch-her skinny. And she has a great unsmiling face! Happy Release Day, El!! Hard to believe it was just 3 years ago that we were both hoping to sell our first books! It feels like much longer!! Enjoy this special time!! 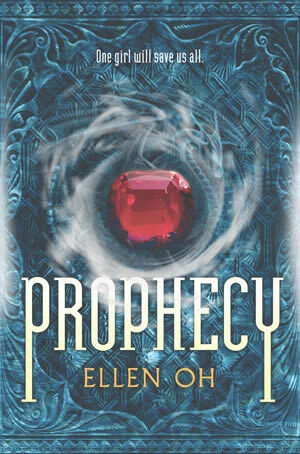 I'm super excited to read Prophecy! I'm Korean (my last name's Oh too, which probably means we're related in some way, along with Sandra Oh) and I'm totally going to read Prophecy w/ saeguk, historical dramas in the back of my mind. I'm so glad you added Yoo Ah In! He's sooo cute and yes, such a great actor. Again, super excited to read Prophecy!! ELlen, I'm a day late, but still thinking about you! I hope your pub day was wonderful!! Congratulations! !